Don't you just love those odd bod shops you find sometimes? The ones that are not part of some big chain company, but are just a little family business. The people run the shop not to make money, but because it is their passion. The thing is, those kinds of shops are usually restricted to small towns or villages; they are hiding tucked away down a little side lane, in a period feature building, where you have to duck to get in (well not me, I'm too titchy). Well not in the case of Copperfield's, a secondhand bookshop in Wimbledon. The owners, Joe and Jane Thubron love books of all kinds, and have a collection of over 42,000 (that will keep you busy for a few years). They supply books on subjects of every kind: philosophy, history, art, plays, poetry, crime, zoology, children's, and many more. When you walk in it is like entering a treasure trove of adventure and knowledge. Books are piled high from floor to ceiling. I venture there regularly and could literally spend hours browsing through them all. 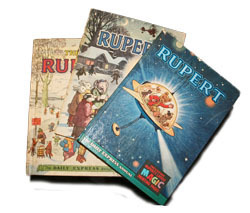 As well as popular fiction, they also sell rare and specialist books, such as first additions, academic texts, antiquated books, leather bounds, children's annuals, signed books, and complete volumes. Books start from as little as £1, but some of the rare books can reach over a £100. My main area of interest is old or classic children's books. It is so exciting to find a book you have been searching for, for ages, to then just spot it unexpectedly under a staircase (I told you they were stacked everywhere). What is even better is when you find a book you want, but didn't even know existed. When I was a kid, I used to love the cartoon show The Moomins; I was very surprised to find while rummaging around, two Moomin books. I didn't realise until then that the The Moomins were originally a series of short tales by Swedish novelist, Tove Jansson. The only real problem with the store is that it is too small to fit everything in. Like I said, the books are piled high, and in some cases it is either impossible to get to them, or you have to play a dangerous game of Jenga, being careful that they don't all fall down. Copperfield's is open seven days a week, and is only a few minutes away from Wimbledon Station. If you are looking for a particularly rare book, then you can contact them and see if they have it in stock. Personally though, I always find it more satisfying to go and search myself. Who knows what I might find?